My fabric printing course is over for the term. I took wine and snacks to our show and tell end of term celebration. And I wore this outfit. 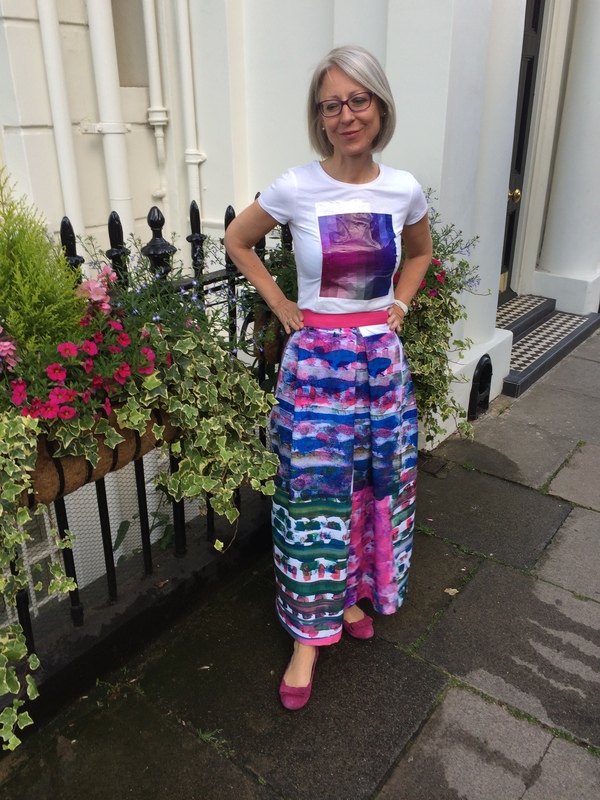 The T shirt has my pixellated peony on it, and the skirt is fabric is the printing samples made with heat transfer inks and the heat press. I didn’t use a pattern. I put the zip in the side seam, put the tube on “Camilla”, my mannequin, and arranged the two front pleats. I positioned the back darts, taped the waist pleats and attached a waist band in pink linen. It closes with one red button. 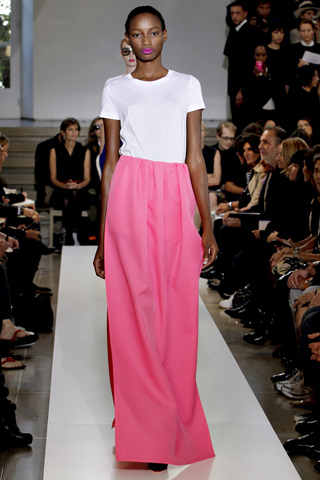 The look of the outfit was inspired by Jil Sander’s evening wear. How do you print fabric like this? First paint one or more sheets of paper with heat transfer inks. 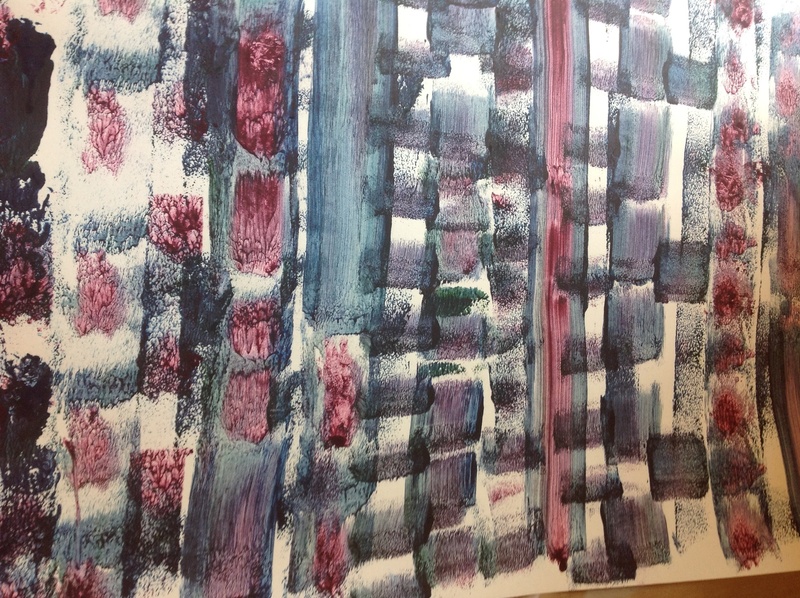 As you can see the colours look rather murky on paper but after they spend one minute in the heat press the white fabric is transformed into glorious colour. I found I could reuse the paper sheets three of four times although the effect got progressively lighter. 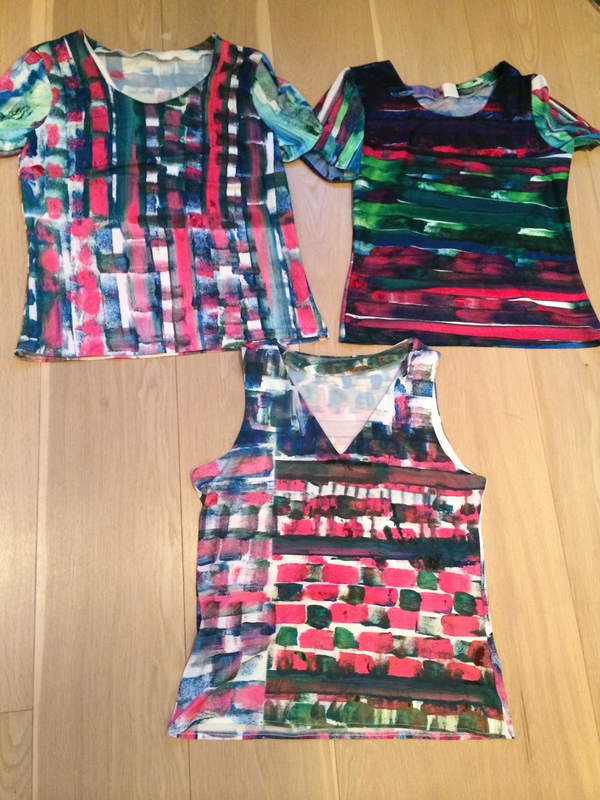 I also made up three T shirts – two round neck sleeved versions and one V neck sleeveless. They are towards my entry for the Sporty Summer Sewathon. My shorts have had an outing already on this blog. And on the road. I took them for a run and they were the best shorts I have ever worn. Comfy, lightweight, gloriously colourful. I read on Karen Ball’s blog (interview with Fehr Trade) that the sportswear manufacturers who do womenswear say they “shrink it and pink it”. Very funny, and true. Except I find it’s mainly black. I have a few little bits of fabric left. I made a hat but Nick and Esme thought I looked like a nutter in it, so I will need to work on that a bit before I go public. I may cover some books with the last scraps – it makes for a highly individual present. Next term we will move on to screen printing. That gives me a couple of months to come up with some new ideas. Your course sounds really interesting. All the prints and garments are so vibrant and colourful, but my favourite are the t shirts. Very sporty and summer-ish. Really interesting reading about your course. I’ve never tried using heat transfer inks – I like the effect and bright colours you get from them. 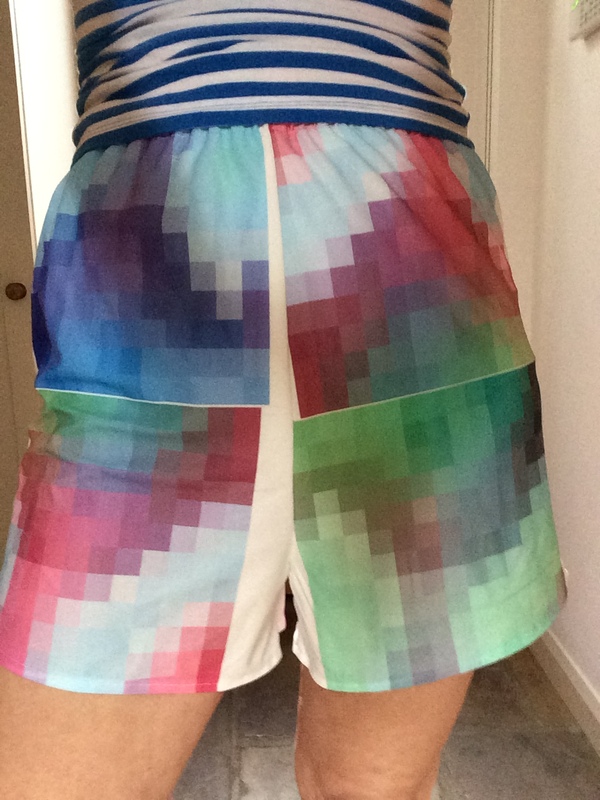 Also, really like the pixel prints – I’d like a handbag made out of that fabric! Beautiful T-shirts indeed and unique. I’d love the one on the right and I wouldn’t dare run in it!! As you know…….I just love this outfit!! I feel the need to post my thoughts. Firstly………..so…..fresh, summer-y and spontaneously done! bravo! I have never thought to view run ways for inspiration…….what a great idea and you have hit this one on the mark as far as I am concerned. Causal, fun, and classy…….and artfully done too. How cool……..with that Hippy Dippy Artsy Farsty favour..yet modern and fresh. I say…..”excellent”. Cheers! YOu are an inspiration to be Brave and Adventurous ! Keep that inspiration coming… and good luck to you and your daughter!